"They that can give up essential liberty to obtain a little temporary safety deserve neither liberty nor safety." -- Benjamin Franklin, Historical Review of Pennsylvania, 1759. 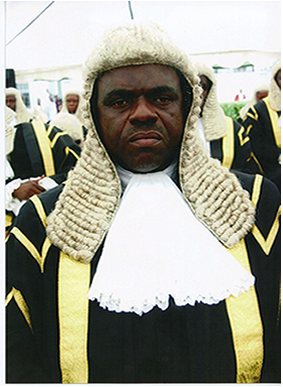 Justice Tsoho, John Terhemba was born in Benue, Mbaduku Vandeikya LGA on the 24th of June 1959. He went to St. Anthony’s Primary School, Chenge- Mbaduku (FSLC) from 1967 -1972. St.Michael’s Secondary School, Aiide (WASC) from 1973 – 1977 and also attended Murtala College of arts Science and Technology,Makurdi (IJMBE) from 1978 -1979, while Graduating from University of Lagos (Bachelor Laws Degree LL.B. (Hons) 1980 -1984 and Nigerian Law School (Bar.at Law) from 1984 -1985. He was then made Inspector of Area Court, Benue State Judiciary from January 1986 – Dec. 1987 before he became Magistrate/ Chief Magistrate, Benue State Judiciary from January 1988 – March 1996. Then he was Appointed Arbitrator in a Contractual Dispute from February 1994 –June 1994 and made Acting Chief Registrar, state High Court on 9th October 1997. Finally, Judge, Federal High Court – 12th Nov. 1998. I had to layout his profile, that we may observe the rise and fall of Justice John Terhemba Tsho so that we all can see that it takes years to build up a successful career and only seconds to destroy it, well that happened to be the story of Justice Tsoho John Terhemba, who destroyed his career and reputation by the way he carelessly handled the case of the leader of the Indigenous people of Biafra(IPOB) Nnamdi Kanu, all in the name of carrying out the personal agenda of President Muhammadu Buhari who's so keen on sending Nnamdi Kanu to jail, while thinking that would stop the agitation of Biafra. Justice Tsho sold his name, reputation and career for a mere N100Million. Well, to some that's a big payday but like the saying goes" A good name is better than precious ointment". It takes 20years to build a reputation and five minutes to ruin it. Justice Tsho ruined his career and reputation by taking certain questionable steps and rulings that wasn't applicable to the oath he took towards upholding the rule of law. He not only stood against Justice but he tried to frustrate it. Looking back to some of the events that transpired during several court proceedings held by Judge Tsho, one would say he deserved what he got. He was caught atimes going against his own rulings. This was a man who initially ruled against the prosecutors bringing in masked witnesses before going against his own very ruling after consulting his Puppet master (Muhammadu Buhari) to now enforce that the witnesses were allowed to come masked. Not all, Judge Tsho was also fighting real hard to make sure a secret trial was carried out for the prosecutors. Such controversies were the beginning of his downfall. A common belief is that corruption is a Judge taking bribes. It's no wonder counsel to the defendant Chuks Muoma, had to file a petition against him before the National Judicial Council (NJC), after so much conflicting rulings and influence from both the DSS and president Muhammadu Buhari. At that moment, Justice Tsho knew it was over for him, he then had to further announce that he will no longer preside over Nnamdi Kanu's case, stating that the essence of justice is based on confidence in the court by all parties involved. Indeed it is, but you should have realised that earlier before selling your prestige and career to Muhammadu Buhari. At the end it all ended very badly for Justice Tsoho, John Terhemba. Corruption in the Nigeria Judicial system has now been aggravated by the presence of Muhammadu Buhari who is so keen on bending the rule of law to enforce his own handwritten outcome and corrupt judicial system not only violates the basic right to equality before the law but denys procedural rights guaranteed by the Nigeria Constitution. President Muhammadu Buhari who is a thug towards the Judicial process in Nigeria, now sends his area boys(DSS, EFCC, SSS) to threaten and arrest Judges who went against his dictatorial government towards granting Nnamdi Kanu bail and several others like Sambo Dasuki, while also arresting and harassing Judges who refuse to favour his government. But Judge Tsho knew the risks and the implications of bribery and corruption in the judicial system yet he decided that was the part he was willing to trend upon and at the end, it consumed him. This will be one of those bad stories one would use as an example when advising upcoming lawyers on what part to cross and not cross if given the opportunity to be in the same position as Justice Tsoho, John Terhemba. My reason for writing this short piece is not to mock or criticize Judge Tsoho but to make it serve as a lesson and a warning to anyone who would think of following in the same footsteps as him, while handling the case of Nnamdi Kanu the leader of the Indigenous people of Biafra because it might even end badly or worse for whoever would decide to be influenced while handling his case. Judge Binta Nyako please also take note of this so as not to repeat the same mistake your follow Judge made because the world is watching closely now and we the Indigenous people of Biafra(IPOB) would always be there to expose any questionable decisions. We are with you every step of the way. And finally, here is a quote I would like Justice Tsho to ponder upon as he reflects on his bad judgment and selfish decision making towards Nnamdi Kanu's case that ruined his career.